Chris Stapleton just won three Grammy Awards, including Best Country Album, Best Country Song for “Broken Halos,” and Best Country Solo Performance for “Either Way,” blew the doors off of many with a pair of marquee performances on Saturday Night Live with Sturgill Simpson, and now he’s celebrating by releasing a bunch of new tour dates with a couple of really cool openers in tow. Chris Stapleton’s “All American Road Show” tour has just released an additional 36 dates, taking the Kentucky singer and songwriter all across the United States. That’s on top of already-announced shows such as an appearance at the Houston Rodeo, the MGM Grand with Nikki Lane, and a slew of festival dates. Along for the ride will be Brent Cobb, who received his own Grammy distinction by being nominated for Best Americana Album for his record Shine On Rainy Day, and Marty Stuart and the Fabulous Superlatives, whose latest album Way Out West was also considered a favorite by many in 2017. Booking Marty Stuart and Brent Cobb for the tour also shows Stapleton’s loyalty to the roots of country and songwriting, despite some calling into question his credibility among so much success. Chris Stapleton continues to set records and defy expectations, with his music already receiving a sizable boost from the Grammy Awards and SNL appearance. Many fans are also wondering if he may show up on stage for next Sunday’s Super Bowl when pal Justin Timberlake performs at halftime. Tickets will go on sale to the gen pop February 8th. If you’ve got some backdoor via a fan club or credit card scheme, now’s the time to act because many of these dates will sell out. Was so pleasantly surprised when scrolling through the dates to see that he’s coming to Upstate, NY! Can’t wait! Not sure why he would play a concert in Alpharetta on Oct 19 and move it 20 miles down the road to Atlanta the next night. Seems like a lot of OT for the roadies. Exciting! Brent was great when he opened for him last year. I’m going to do the St. Louis show again. Looking forward to Marty. Saw this show when it hit Jacksonville last November. Missed Brent Cobb due to really poor traffic control by Jax PD and event staffing (an hour to go 2 miles…..really? ), but my God, how flipping good Marty and his Superlatives were. And Stapleton, of course, was great. But Marty….saw damn good. Glad for Marty and the Fabs as more fans need to hear them. There is NO better band in Notsville, Pukesville, Bashville, non-countryville than them. And that is not an overstatement. I agree. 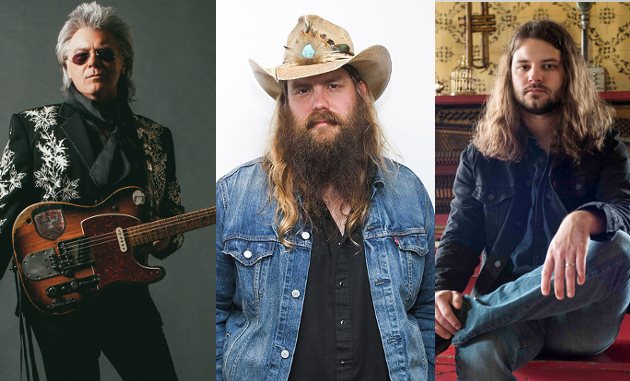 No, Chris Stapleton is not perfect. But he just won three country Grammys, and these are who he chooses as his touring partners. Headlining Madison Square Garden — wow! That has to be a career milestone for any musician. The fact that I can walk there from home has me just a litttttle bit excited for November! I’ll be there will bells on (cowbells, that is). Marty Stuart about does the finest cover of Marty Robbins’ El Paso as I’ve ever heard. And he has given many artists a platform for years and has massive respect for the history of the genre. And if you haven’t heard Brent Cobb do White Lightning, might want to check it out. I just saw Marty in Santa Fe. Wayne the Train opened. Excellent show. Hope to catch the Sandia Pueblo show. I was looking at the tour dates just this morning and noticed all of the dates with Marty and the Superlatives . I thought the exact thing you stated above Trigger . CS could have anyone on the planet open for him and he picked the right guys , I think . Definitely displays an allegiance to his roots AND to his fans . You have fans in Kansas too, Chris. Swing by some time. Bummed I didn’t see him before he started doing arena shows. I won’t waste my hard earned on an arena show. Really hope tickets don’t go that quick for Kentucky. Won’t have the funds to buy tickets when they first go available. These will be awesome shows. Seeing Marty and the Superlatives live should be a must for any country music fan. So will this make Chris Stapleton a credible country artist with integrity? Probably. More of this, and less of lending himself out to genre parasites. Saw Chris with Marty and Brent in Little Rock, AR in November, and none of them disappointed. Marty Stuart was the standout for me, which isn’t a knock on Chris or Brent as much as it is indicative of Stuart’s performance. I’ve never seen a mandolin solo, but I was completely captivated by his. I was also quite impressed by Brent Cobb, who I hadn’t paid much attention to before that moment. Generally I suffer through openers at most concerts (for instance, Lauren Alaina opened for Alan Jackson here, much to my chagrin), but Chris’ show was great top to bottom. I’m considering going to see these cats again in Rogers, AR. I’m in Vegas for a work conferance the week before and I fly out on March 23rd. Really thinking of staying an extra day for this show. Hey Trigger, that last date should say Charlottesville, VA.